The Sri Lanka Collection is pleased to announce the addition of its newest collection member, The Last House. This Geoffrey Bawa-designed five-bedroom boutique property sits on secluded Mawella Beach on the south coast of the island. Rooms may be booked individually or the whole villa can be rented on an exclusive basis (sleeps up to 14). The Last House is also a perfect venue for weddings and special events for up to 40 people. 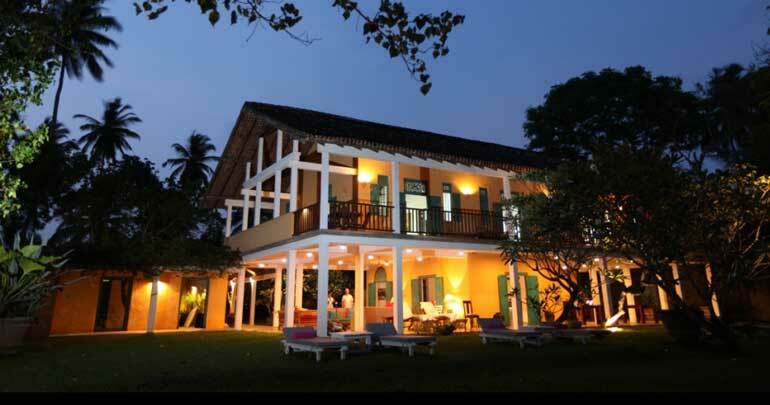 Renowned for its warm hospitality, individuality and fabulous food, The Last House makes a wonderful weekend escape and is ideal as a stop off when travelling between Galle and Yala or the Hill Country. The Last House was the last private commission by Geoffrey Bawa and its simple yet thoughtful design greatly reflects his tropical modern aesthetic. Two bedrooms are located on the upper floor of the main building and a further three situated on the ground floor of an adjacent building beside a courtyard swimming pool. Space flows freely between indoor and outdoor areas offering many private places to relax and dine. The Last House is staffed by an efficient team and the chef is responsible for some of the region’s best food – Asian-fusion cuisine starring ocean fresh fish and seafood along with plenty of delicious Sri Lankan curries. The palm-shaded lawn and the expansive beach make this hotel very family-friendly whilst the in-room balconies and verandas ensure plenty of privacy for couples too. The first floor – comprising an expansive double and a twin room – are always booked exclusively ensuring privacy irrespective of whether one or both rooms are occupied. Tangalle is famed for its picture-postcard beaches and castaway charm. Beautiful Mawella Beach is unspoilt and the preserve of local fishermen. By day you might swim or surf in the sea; or stroll the bay and observe fishermen pulling in their nets methodically from the ocean. Explore the local area on foot or by bicycle, bird watch at the lagoon or visit sacred Mulgirigala Rock Temple. Nesting marine turtles are often spotted on Mawella Beach at night. The Last House is located 7 km west of the south coast fishing town of Tangalle and just 2 km east of the Air Taxi landing spot on the Mawella Lagoon. Matara, the southern terminus of the expressway and railway line from Colombo, is 30 km away. Galle can be reached in 90-minutes. Yala and Udawalawe national parks are both two hours away by road. Travelling time to The Last House from Colombo is three hours by road or four hours drive from Colombo’s international airport. Flight time from Colombo by Air Taxi is 80 minutes. The Sri Lanka Collection, a UK-based representation and marketing company, works on behalf of a distinguished collection of Sri Lankan boutique hotels, villas and safari camps. The company raises awareness of Sri Lanka’s outstanding boutique travel products and helps them to maximise their visibility in the UK. The Sri Lanka Collection is the first representation company of its kind to focus on the high-end client and on Sri Lanka alone.